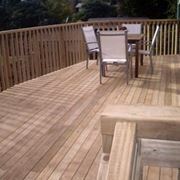 guarantee that our workmanship at Custom Decks and Fences is nothing less than the highest standard. We are constantly looking at “what’s hot” over seas and learning new techniques and designs. We use premium grade treated decking which is virtually knot-free and annular grooved nails to eliminate any decking lifting over time.